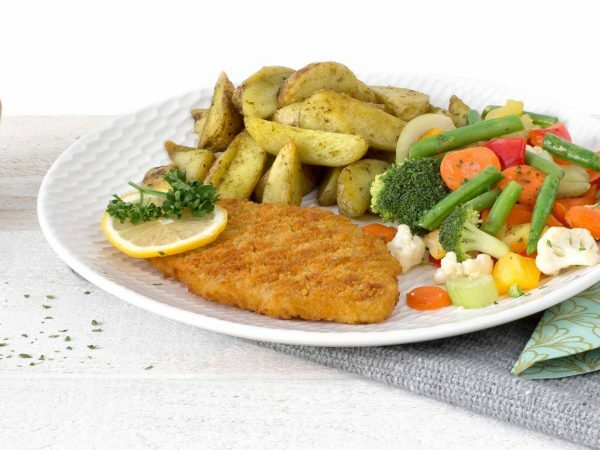 The Schnitzel is a crispy breaded plant-based protein food product with a delicious taste that goes well with a meal accompanied by potatoes and vegetables, for instance. The main ingredients are soy and wheat protein. This product is also enriched with vitamins and minerals making it a full-fledged meal component. This vegetarian Schnitzel is available as a 90-gram as well as a 100-gram product. Was best-tested in 2011 by the Dutch Consumers Association. Water, vegetable proteins 16% (soy, wheat gluten), breadcrumbs (wheat), sunflower oil, egg white*, wheat flour, starch (potato, wheat, corn), flavouring (celery), salt, herbs and spices, mineral (ferrous fumarate), vitamin B12. * Free-range eggs. Produced in a facility that processes peanuts and nuts. Frying pan: 6-8 minutes on moderate heat. Turn every now and then. Oven: 8 minutes at 180°C. Turn once.